had heard about the increasing popularity and seen on various instagram and facebook feeds quite a bit about this place recently, so decided to drag (okay fine i didn’t have to drag; the fam bam is always willing to hunt down good food teehee) my family there for a meal one sunday evening. 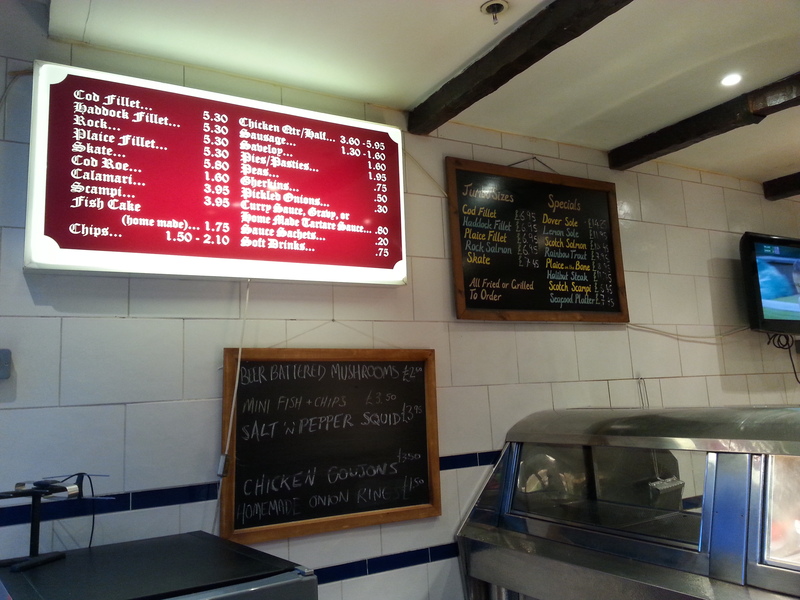 the set-up remains the same today, but i now see the place as being charming in its own way, the kind of casual family place which people visit in their shorts and flipflops, with the menu scrawled in multiple colours on a chalkboard that stretches across the wall. its a bit like a secret shack hidden amidst car workshops nestled in sin ming, which i guess some might find appealing since it offers something very different from the usual modern set-ups that we so often visit these days. we ordered 3 types of crabs, their famous beef, a plate of hokkien mee, and of course some glorious fried mantous (cannot live without, especially when there’s chilli crab sauce to be slurped up) for the 5 of us. they were having a buy 2 crabs get 1 free offer when we visited (there was a huge banner outside announcing this deal so i won’t be surprised if its a perennial offer) so that’s why we went for 3 crabs; if not for the fact that anything more would have been too much food, i think we might have given the other interesting options on the menu (like the pork knuckle) a try! the crabs were all rather small and the meat was not particularly sweet or firm, though they were reasonably fresh. they were decent crabs though, and very reasonably priced if you take up the buy 2 get 1 free offer. the highlight of the crab dishes for me was definitely the different sauces of each style of cooking. besides the fact that the crab was on the (very small) side, we all thought the sauce was really delicious! 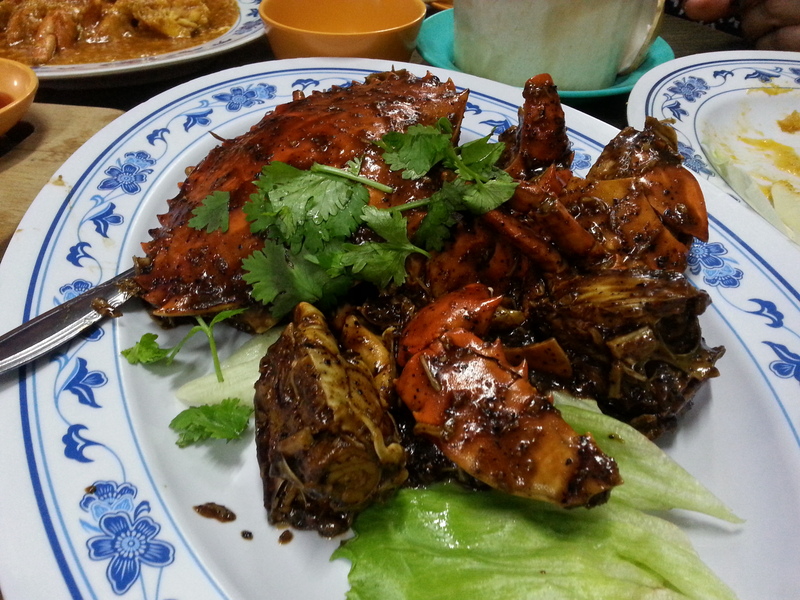 it wasn’t the kind of black pepper crab that is very dry. instead, it was a little more sauce-y than usual (though from the pic it doesn’t appear to have much sauce at all on the plate i know); i prefer it this way but i’m not sure if everyone has the same preference! the sauce was very tasty and of the right consistency and pepperiness. i generally prefer crab done in other ways, but thought this was good nonetheless! we also got a salted egg yolk crab: more tiny crabs! i’d like to think it was because they chose the smaller ones for us since we were a relatively small group attempting to eat 3 crabs? i am generally in love with anything that has salted egg yolk in it; i absolutely adore salted egg yolk and all its super savoury and tasty goodness. this dish was certainly no exception and was in fact one of the better salted egg yolk dishes i have had. they were generous with the egg yolk coating, and in my opinion, totally nailed the rich and grainy texture of the salted egg yolk paste. i could not get enough of this and am also guilty of licking the crab shells clean. shell-lickin’ good? 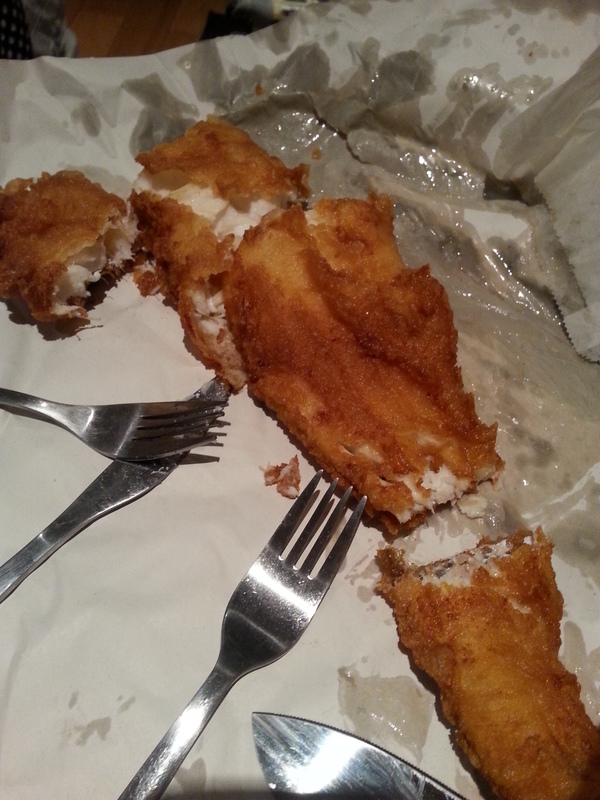 i also polished off every single bit of the paste left on the lettuce leaves. am definitely getting something in this style the next time i visit, if not crab then squid! the chilli crab gravy was also very yummy and i loved the fact that there was plenty on the plate for us to drench our fried mantous in. 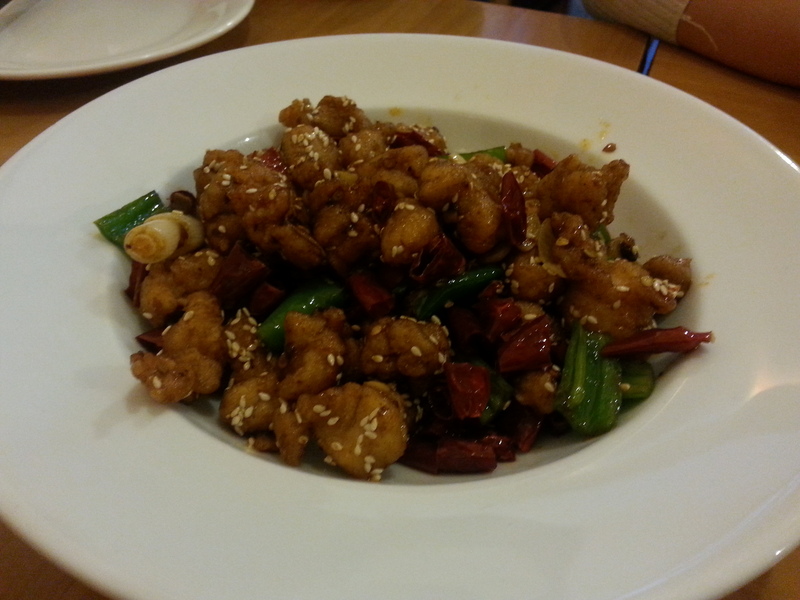 it was of the right consistency – thick enough but not too heavy, and was the perfect mix of sweet and spicy! super yummy. next, we had what nearly every beef-eating patron at ubin seafood orders, the rib eye steak! this was DELICIOUS. seriously good stuff. the beef is black angus rib eye from the states and is reasonably priced for its quality. we requested for it to be done medium-rare, and it was broiled to perfection – super yumz! i loved how the outside was done till it was just very slightly charred and hence crispy with a hint of smokiness, while the inside remained super moist and juicy. served on a large wooden board accompanied by wedges and caramelised onions, the smallest serving of this that you can order is 500g so this is perfect for sharing! 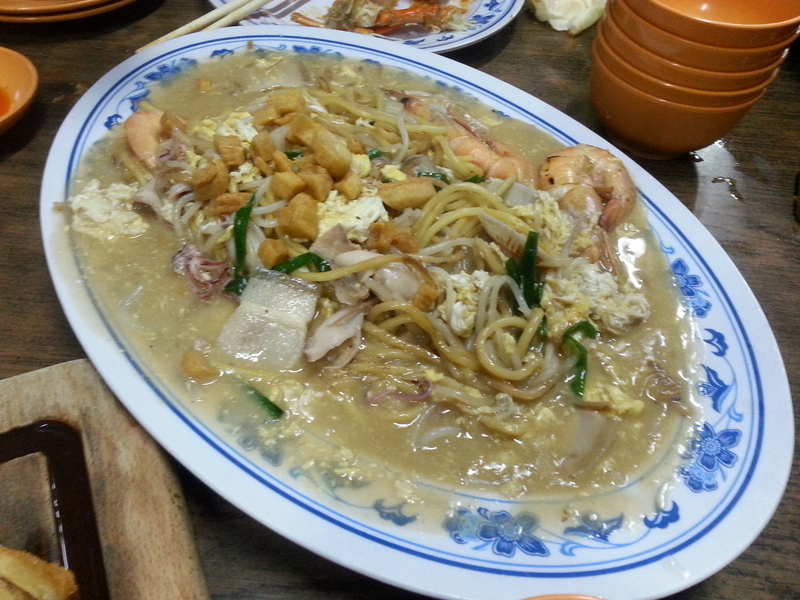 it seems like this is the star dish of ubin seafood, and rightly so. a must-order when you are there! they use the beef fats that were cut off from the meat served to you to fry this super sinful plate of rice. 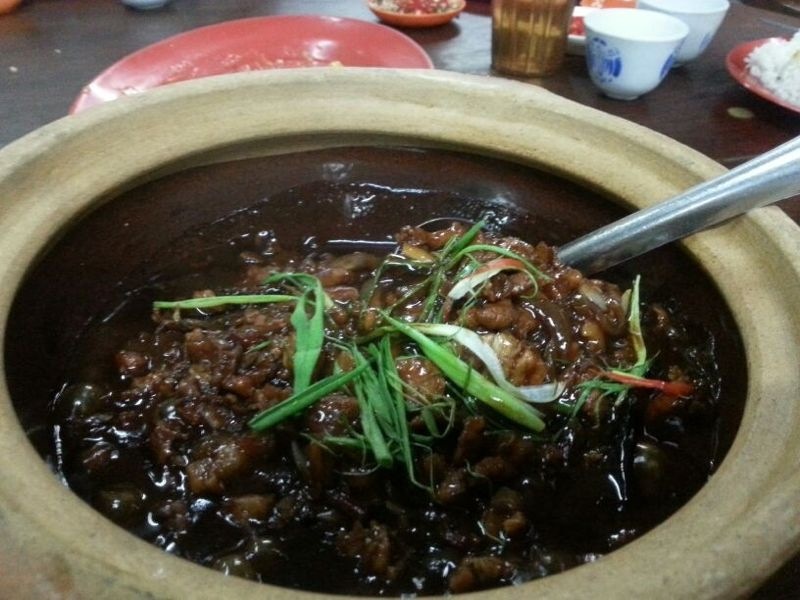 it is a very simple dish with a bit of a smokey taste which really reminded me of claypot rice. though there are many others that rave about it, i thought it was pretty good, but definitely didn’t think it was outstanding enough to warrant having an entire bowl of something so sinfully unhealthy! look at all that pork lard on the top screaming unhealthiness hahaha. this came highly recommended by the staff at the restaurant, and i thought it was pretty good! they were generous with the ingredients and i liked how it was the wet kind of hokkien mee, not the kind that’s fried dry. the sauce was tasty and despite the substantial amount the noodles came with, it remained rather light and wasn’t heavy. not a bad choice if you’re looking for some carbo to order. 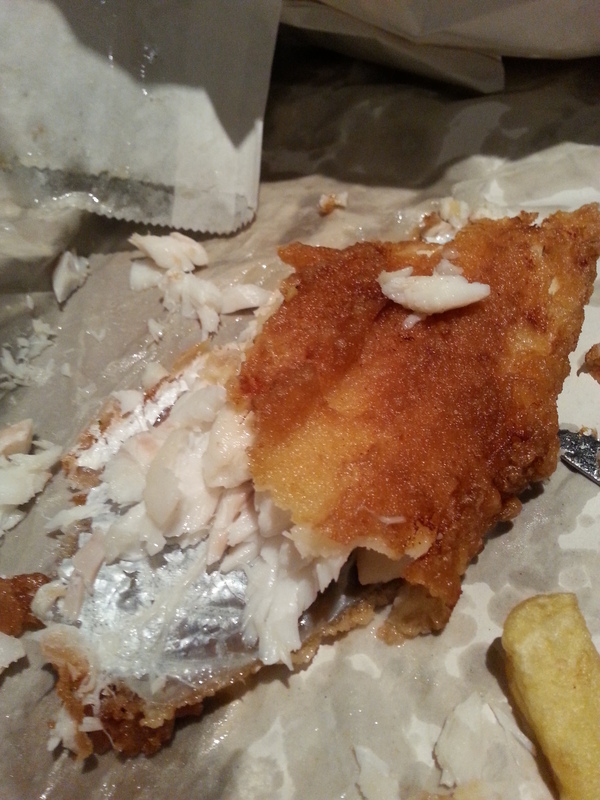 all in all, it was a satisfying dinner with food cheaper but as good as that at the usual big seafood chains! 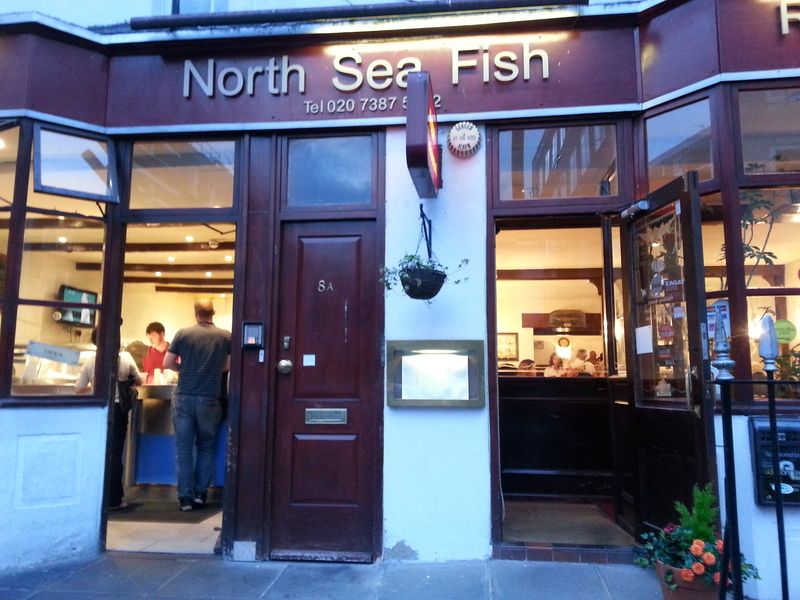 i will definitely be back to satisfy future seafood cravings if i’m in the mood for somewhere casual and slightly off the beaten track. not sure if i’ll bring tourist friends here for seafood though; i feel it’ll be nicer to take them somewhere by the water instead and will probably be worth paying that bit more for a nicer ambience. oh and be sure to make a reservation early before you go; the place is packed on weekends! The alliteration of ‘M’ words is by no means coincidental. Put together the ‘M’s and it spells ‘Mmmmm’ – which is exactly how one would feel after a trip to our friendly neighbours Malaysia. 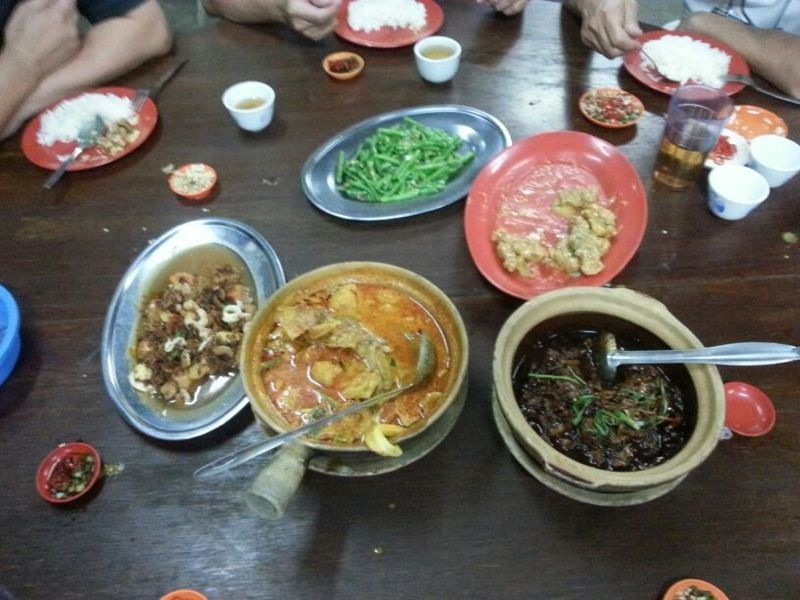 Food in Malaysia tends to be identified with a particular area or town – Ipoh hor fun, Penang laksa, KL hokkien mee, Klang ba ku teh. 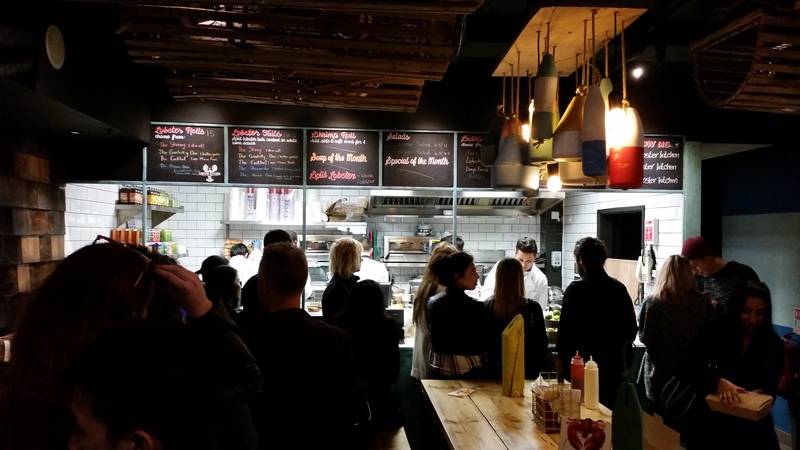 All these individual locations deserve a post on their own, given the true gastronomical excellence that they provide: in each locality, almost every outlet selling the said dishes are of decent, if not top notch, quality. 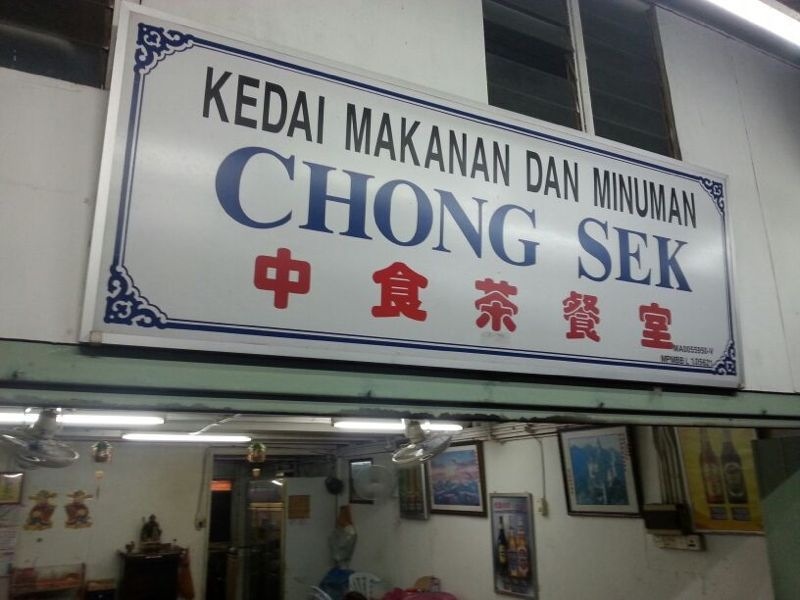 I shall attempt, in this post, to offer a glimpse into the spectrum of Malaysian fare available using the town of Malacca as an example. 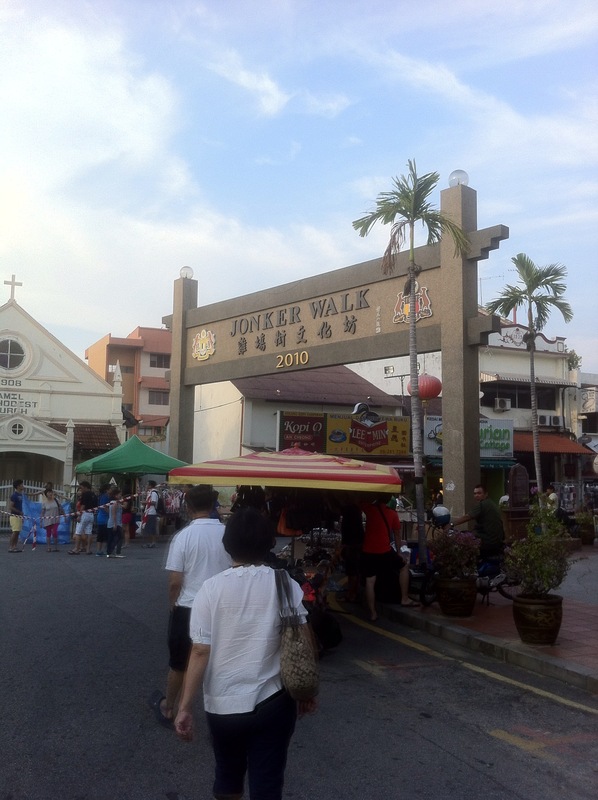 In a recent trip to Malaysia, I was in Malacca and made a trip down to the famed Jonker Street – which , at night, turns into a pedestrianised street (aptly called Jonker Walk) night market selling foodstuff, mobile phone and fashion accessories and much more. 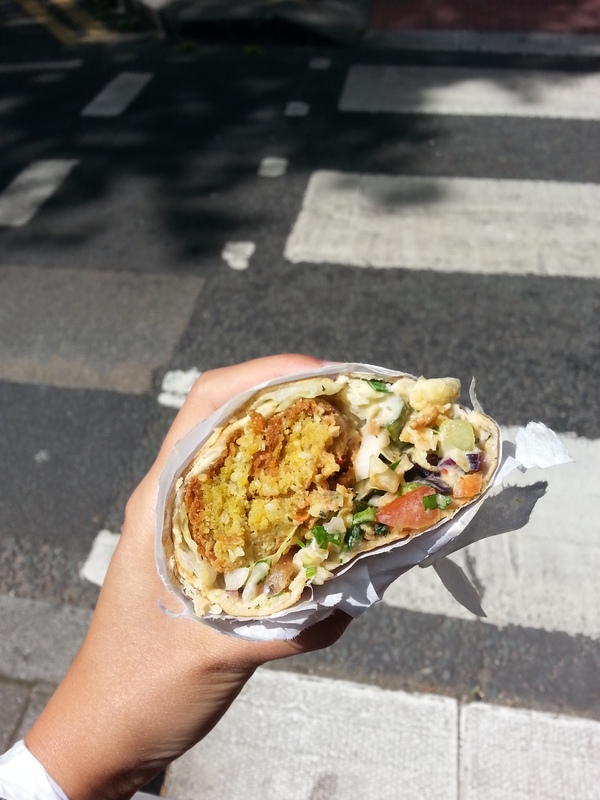 Being a food blog, we will of course focus on the food; however, the history of the street should not be neglected. Back in the old days, Jonker Street was where rich Chinese merchants – trading in the port of Malacca – congregated and settled, making the street the centre of the Chinese community. If you look around, old buildings of Chinese clan associations and temples still exist in their original incarnations. 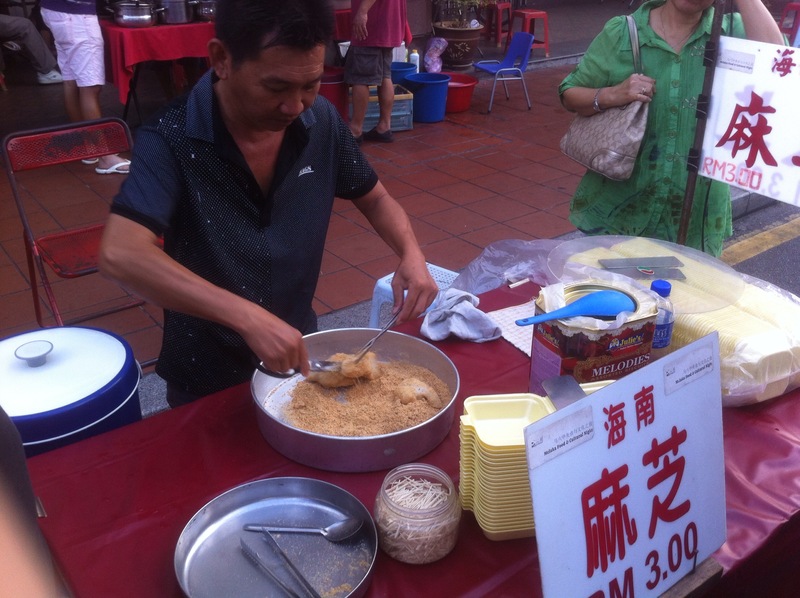 The street market offers fare ranging from the sweet to the savoury, snacks to wholesome meals. Here are some highlights. 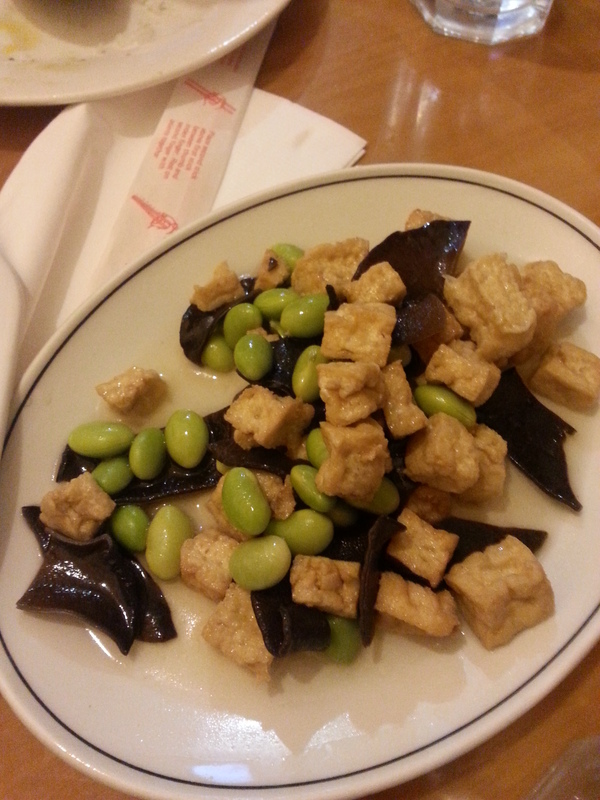 The muah chee here was really smooth and I liked how the peanuts actually are able to fully coat the rice chunks . 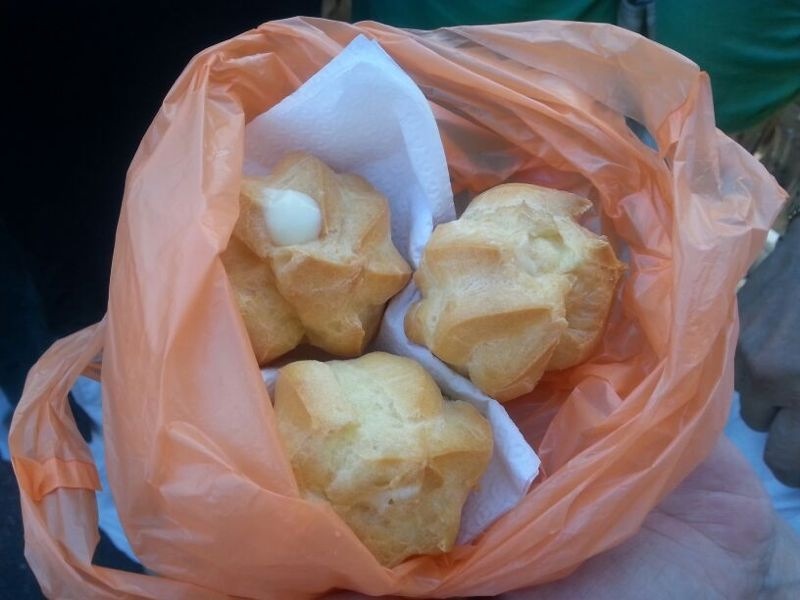 Also, the peanut coating was not overly sweet and you could taste the roasted flavour of the peanuts – which is something most muah chee stalls aren’t able to boast. We get this almost everywhere in Singapore and given a choice, I’d opt for the Singaporean version more often than not. 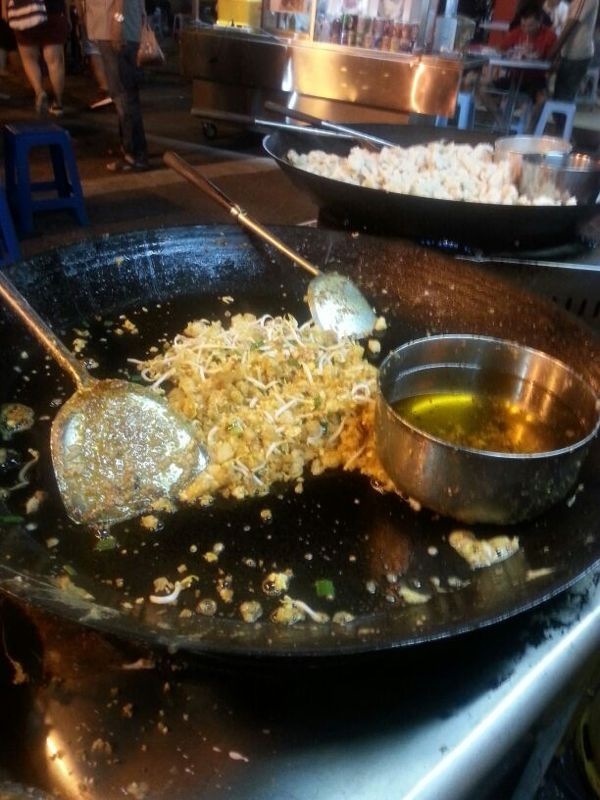 However, note that the fried carrot cake in Jonker Street (and the wider Malaysian food scene) is different from what we’re used to in Singapore. Vendors tend to add bean sprouts into the frying mix and this, I feel, makes a huge difference to how it tastes – perhaps a little too healthy hence my deference to the Singaporean version. Also, often there isn’t a choice between the black and white versions that we are familiar with in Singapore. I guess that’s a good thing because you only need to order one plate, unlike in Singapore where it’s too tempting to just order both! This is interesting. Basically it is a deep fried whole potato cut into small slices. After which you can choose your flavouring ranging from mayonnaise, chilli, black pepper to cheese. 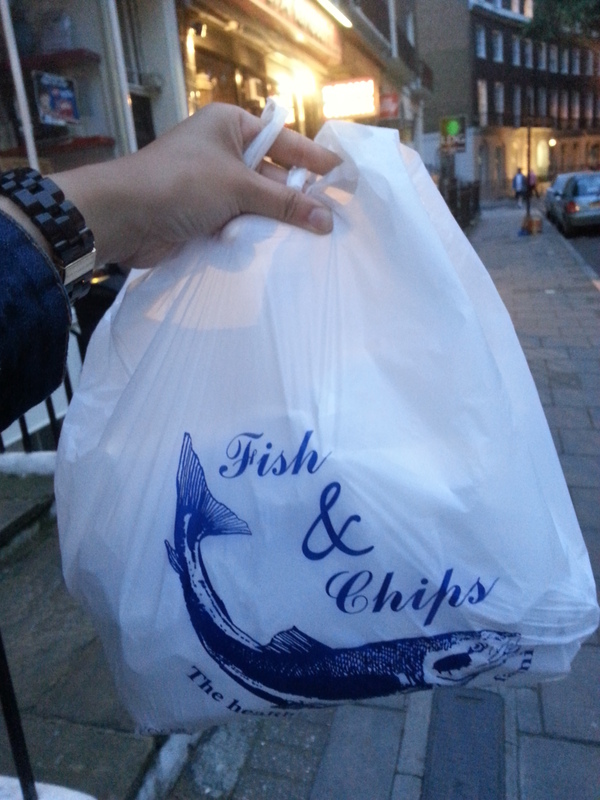 Essentially this is like your packet potato crisps, just that its freshly made on the spot. Coconut Jelly This is my personal favourite. It is basically gelatinised coconut water. This means that the natural coconut taste is preserved and not artificially enhanced and, once again, an extremely refreshing option on a hot, humid day. 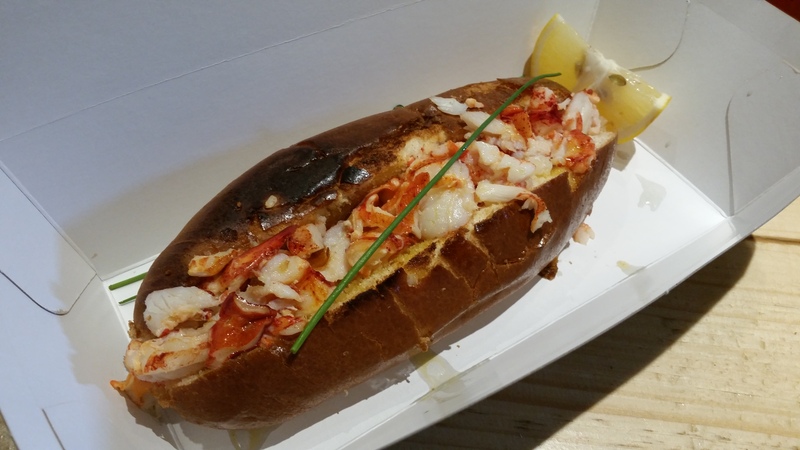 This was not anything particularly special, aside from the fact that the variety was pleasantly abundant and that the ingredients were fresh and served piping hot. No need to queue for hours (*ahem* Tim Ho Wan) or pay sky high prices (*ahem* Yan Ting) if all you want is to satisfy a craving for a couple of prawn dumplings or siew mais. I have always felt takoyaki should be a staple in street markets, given how light a snack and how universally palatable they are. I mean if you don’t take the original octopus fillings, go for cheese! Or if you’re allergic to prawns, have the sausage option! In fact, to me at least, takoyaki balls actually whet up one’s appetite so its presence should benefit the other stallholders as well. The ones here aren’t exceptional as they are too floury for my liking. 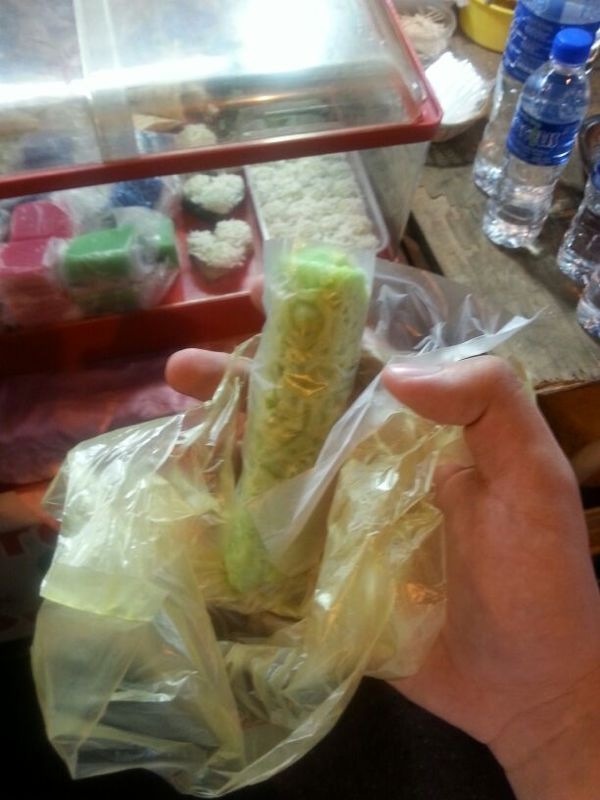 But, as I mentioned, a must have in every street market. As a dish, this is one I always look out for anywhere I go. The thing about Malaccan fried oysters is that they fry the oysters for a rather more substantial amount of time than Singaporean hawkers. Hence you get a oysters that are more cooked. 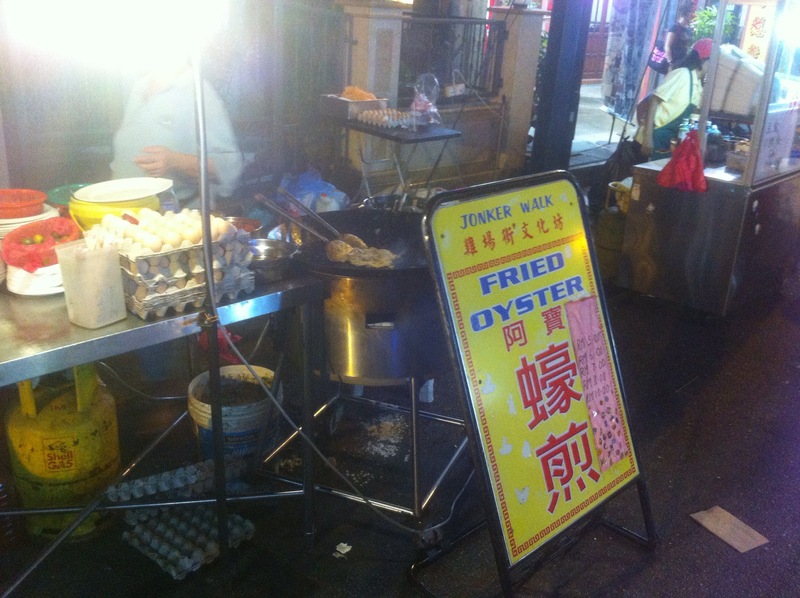 Somewhat similar to the oysters you get in Penang. I personally prefer this style because the oysters become less watery and, texture-wise, goes better with the fried flour. If you are Hepatitis-paranoid, perhaps this version will set your mind at ease (if only by a little). 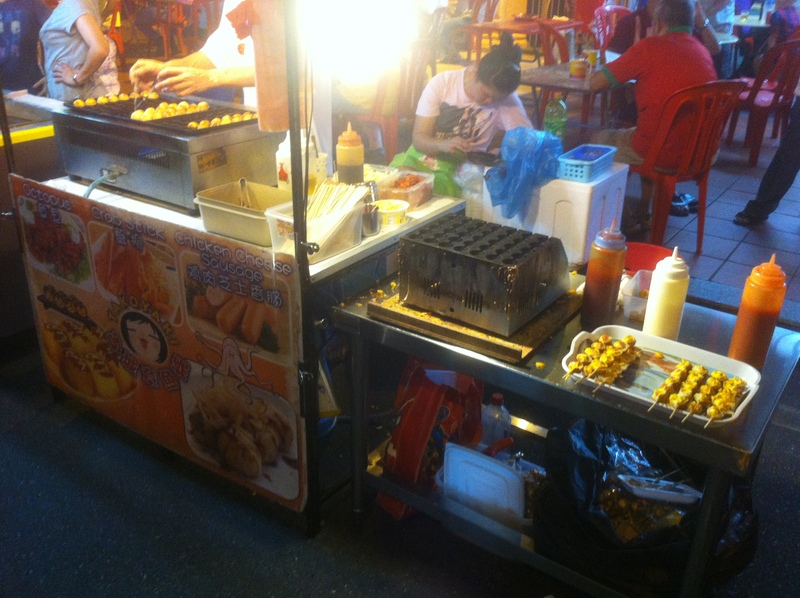 There are also sweet snacks available along Jonker Walk. Here is kueh dadar, a nonya pancake role filled with grated coconut. The one I bought was pretty mediocre but at only RM1? Always worth a punt. 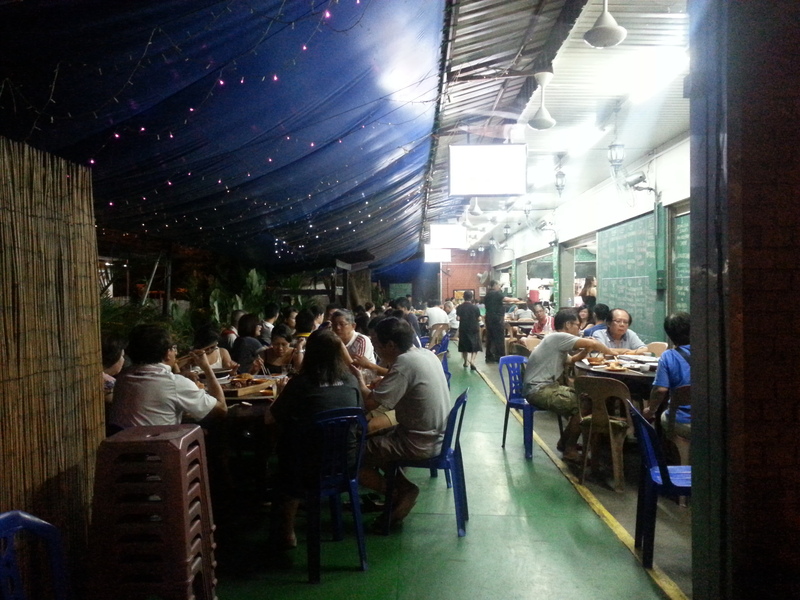 We adjourned to a nearby zi char restaurant for dinner after roaming the streets for snacks. Well everyone deserves a proper meal after walking so much! 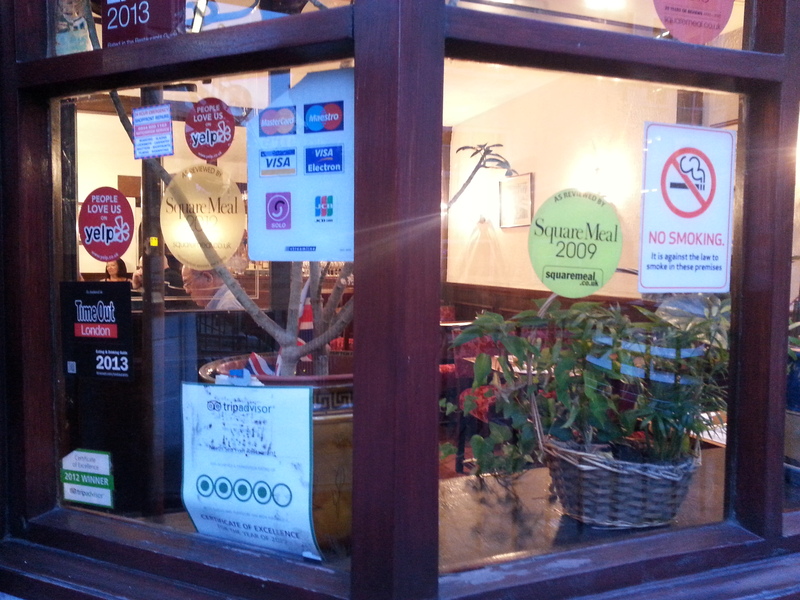 We elected to come to this eatery just metres away from the main food street. The waiting time for the food was more than half an hour but I tell you when the food arrived it, it was thoroughly worth it. 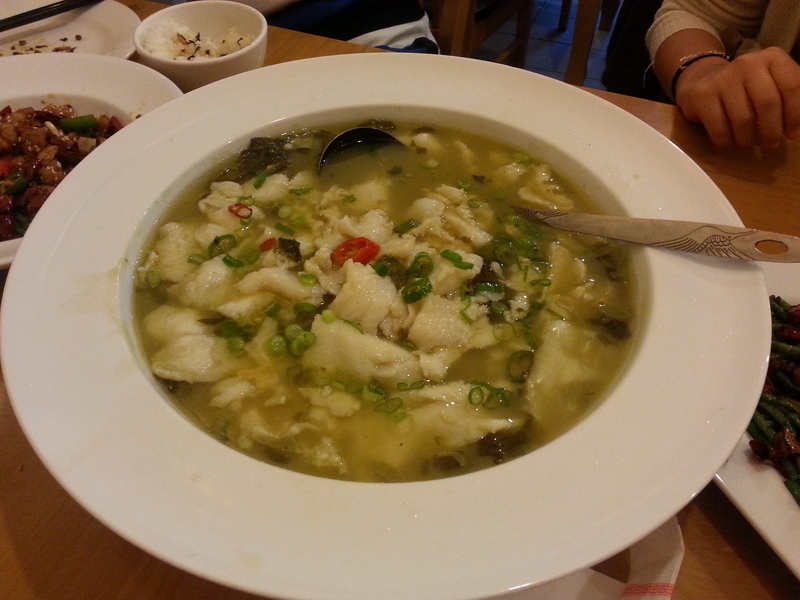 The curry fish head was delightful, the fragrant curry taste and generous servings of veggies. It also wasn’t too oil unlike most other curry dishes. 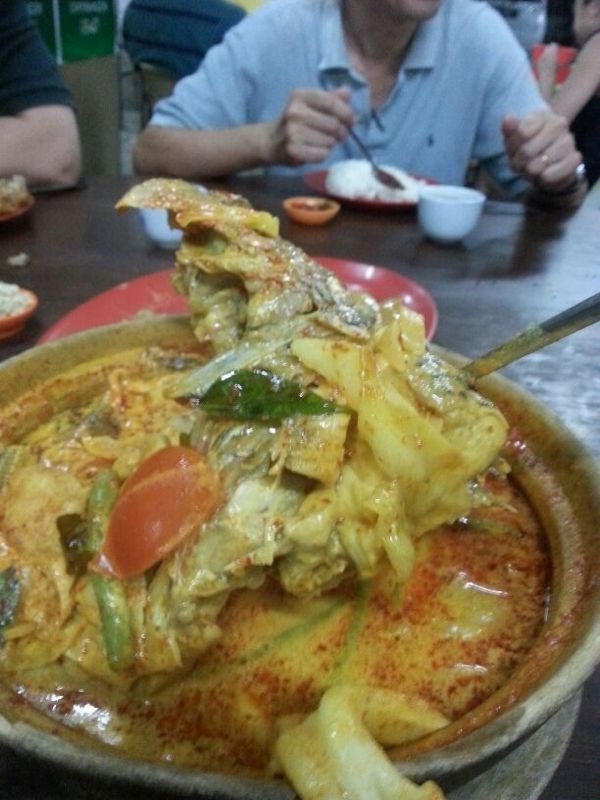 The fish was fresh and cooked to perfection – usually most curry fish head would be pre-prepared, and hence likely to be overcooked; this one had no such problems. 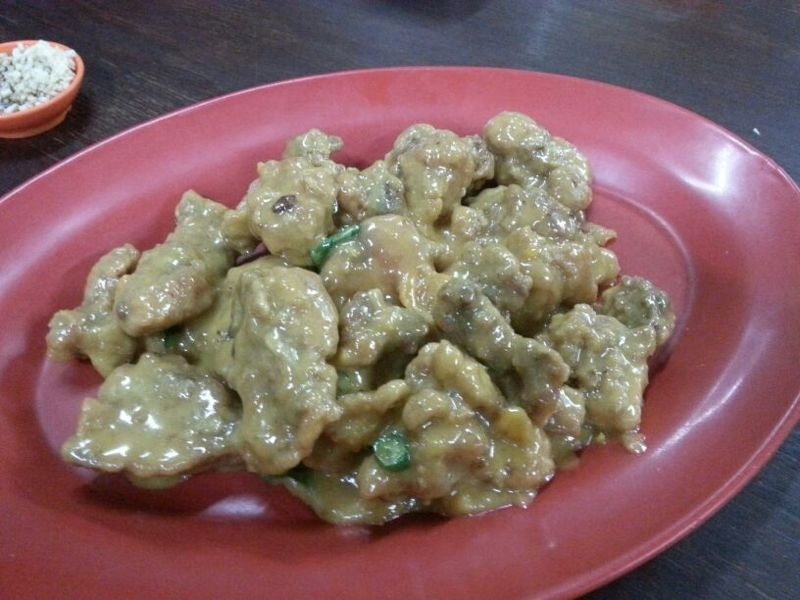 Salted egg yolk fried chicken Basically this was fried chicken coated with a salted egg yolk paste. It could be ordered with pork ribs, prawns or chicken and we opted for the latter. This was quite a unique take on a common zi char dish. The salted egg yolk paste was not too thick, yet it was ultra creamy in texture. No way did it taste like a heart attack waiting to happen as you’d expect with such a rich dish. I also found it a nice touch that the chicken pieces were filleted for our convenience and I was happy to devour each piece whole. This was nice, especially when eaten with plain rice. 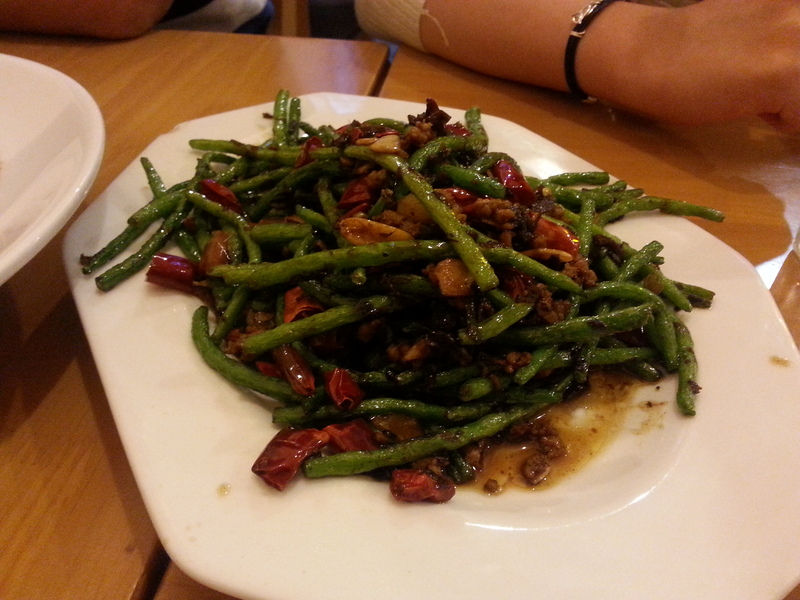 The pork was very soft and the salted fish bits added a panache to the overall taste of the dish. This was another enjoyable dish. 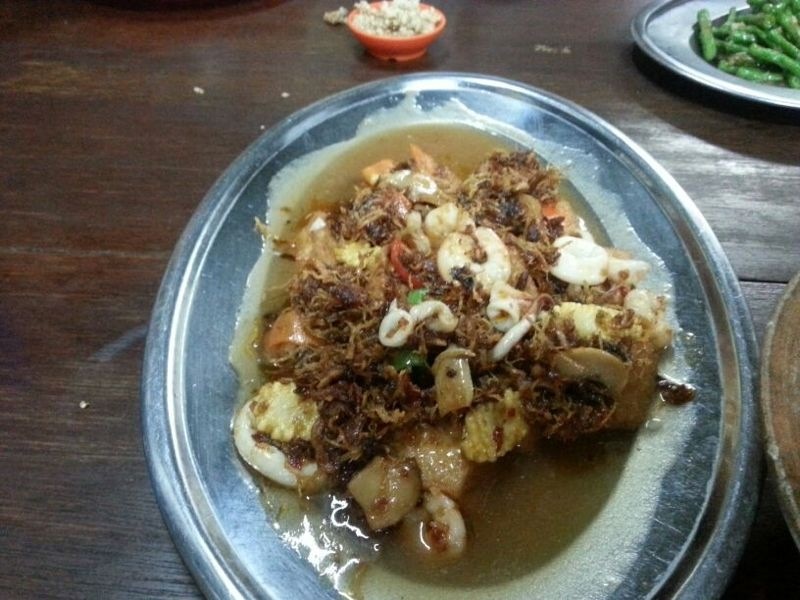 The seafood, comprising prawn and squid, was fresh. What impressed me was the generous toppings of dried scalloped – which was fried till crispy, so much so I almost mistook them for shallot bits! That, of course, would not have done the dish any justice as the scallops – in the way they were fried – definitely enhanced the taste of the dish by miles. 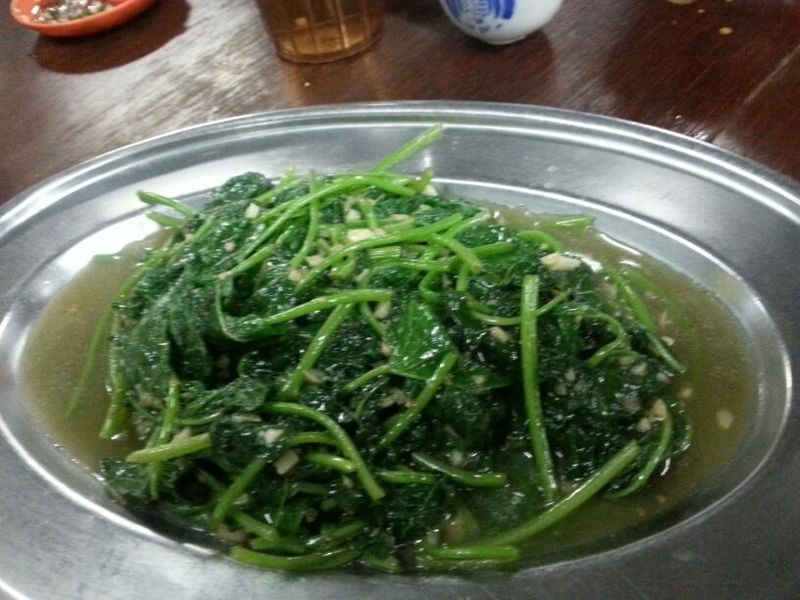 For the sake of a wholesome meal, we also ordered spinach fried with garlic and long beans with dried shrimp. The long beans were especially good, in fact it was so good that it was long gone before I could even snap a close up picture of it. I guess it was due to the fragrance of the dried shrimp; again I suspect that they had pre-fried the dried shrimp before putting in the beans. 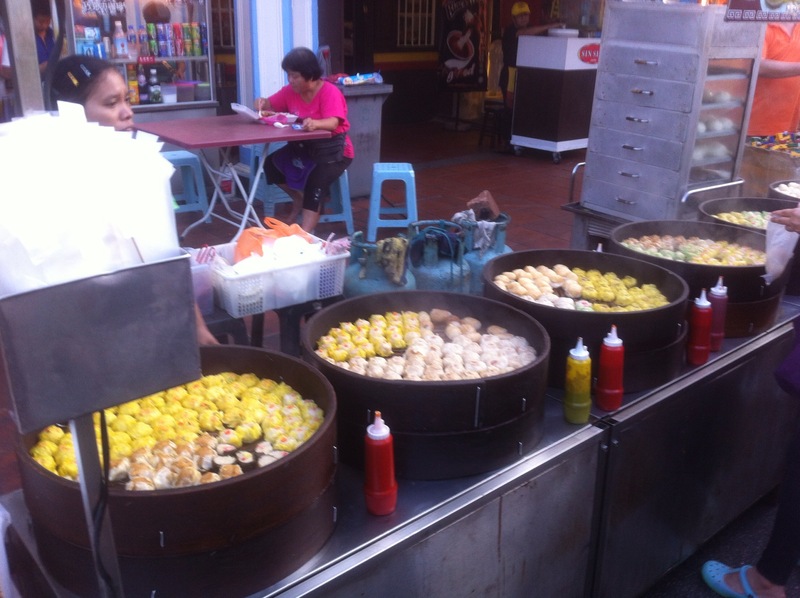 Malacca, and indeed Malaysia as a whole, is certainly a good place to visit for food – the peranakan food scene here is famous but sadly overly commercialised. 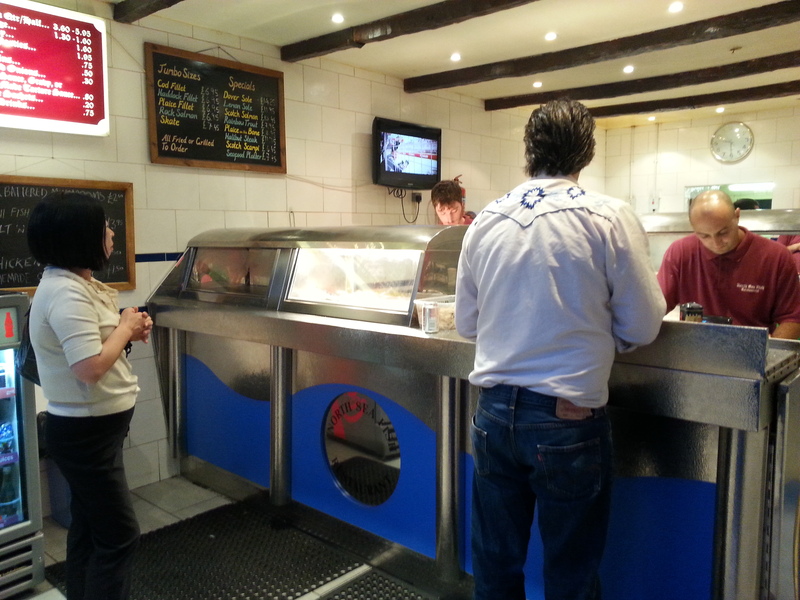 But try your luck and visit any independently-run eateries or stalls and you’ll be pleasantly surprised. More Malaysian posts to come – watch this space!